!! 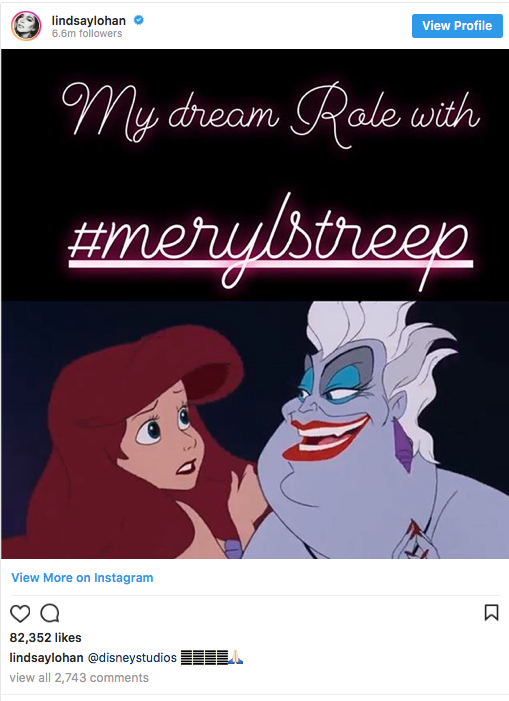 OMG, Lohan thinks Disney’s gonna grant her wish to play Ariel, and Streep to play Ursula !! Even as a mermaid, you couldn’t possibly reach the darkest underwater depths of delusion that Miss Lohan is putting out there these days! Check out her bid to play Ariel, along with an insinuation that Meryl Streep would play Ursula the Sea Witch! HOW VERY DARE! 3 Comments on "OMG, Lohan thinks Disney’s gonna grant her wish to play Ariel, and Streep to play Ursula"
…I don’t think Meryl would want to play a young mermaid, but okay! Since I don’t really care about Lindsey Lohan, and absolutely loathe Miss Streep, those would be the first two red flags against this upcoming revision of The Little Mermaid. The fact that I’m not thrilled about a live-action cartoon is all the more reason to go, Eh! I’ll pass on it!